Update 2.8: Spoils of War has been on live servers since Tuesday. It has arrived with mixed reviews. Like with any software update there are always a few bugs. There are some that seem very puzzling as to why they happened and even how they didn’t get spotted before coming to the live servers. That said there are still several things that have been introduced in this game update that can be enjoyed until the other issues can be resolved. When Update 2.8 went live, it brought along two events: The Festival of Splendor and Double rewards for Galactic Starfighter in credits and Fleet Requisition for leaderboard totals following a match. 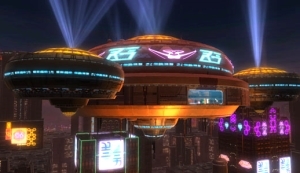 The Festival of Splendor is the casino themed event happening on Nar Shaddaa. The quest can be picked up on both Republic and Imperial fleets and leads players to the Nar Shaddaa casinos. The simple click to spin mechanic is a welcome change of pace and can lead to some impressive prizes. Please remember to be responsible when gambling virtually. The other event has to do with rewards for players in Galactic Starfighter matches. After every match, through July 1st, players will receive double credits and Fleet Requisition rewards based on leaderboard. Daily and Weekly mission rewards will not receive double rewards. The extra Fleet Requisition points will make it easier for players to unlock the two new starships, the Skirmisher Gunship and the Assault Bomber. The Thursday Livestream showcased these two new starships. Both of these versions have added dogfighting capabilities not found in previous versions of either classes of the Gunship or Bomber starships. If you didn’t get to watch this past Thursday’s stream, click on link to view the recorded video. One of the bugs mentioned above has to deal with the Group Finder. It seems that on the live servers the 16-man queue is messing up. As a result, Group Finder Operations will be 8-man instead of 16-man. If this fixes issues with server load and helping keep players connected, it is a good fix. The unanswered questions have to do with the rewards. Operations base their rewards dropped on level of difficulty and group size (8-man vs. 16-man). I don’t think the community has issues with the group size being reduced, as much as the issue with no real incentive to queue up through Group Finder. Let’s hope the Group Finder can be fixed to allow the 16-mn Operations as BioWare had planned or at the very least there is more of a reward to queue using Group Finder. * Group Finder’s Operation queue has been set to 8-Player (down from 16-Player) in order to decrease server load and resolve widespread connectivity and instancing issues. * Addressed a bug that caused Legacy cooldown unlocks to not apply properly for certain Abilities. Does this patch also address the issues like being removed from guilds, increased cooldowns on quick travel / fleet pass etc? The Guild issues have the same root cause as the area transition issues, so they will be addressed by the fix. The Legacy cooldown perks not applying properly are a separate issue, but also being addressed in the patch. It appears the dev team has established that the Guild issues and Legacy transportation (i.e. Quick Travel, Fleet pass etc.) are two different problems and not tied together. As you can read in Tait’s post, the Guild issues will or should be corrected in this morning’s fix/patch. The Legacy perk issues will also be corrected in the maintenance patch from this morning. Hopefully, the rest of the pesky bugs will be fixed shortly. 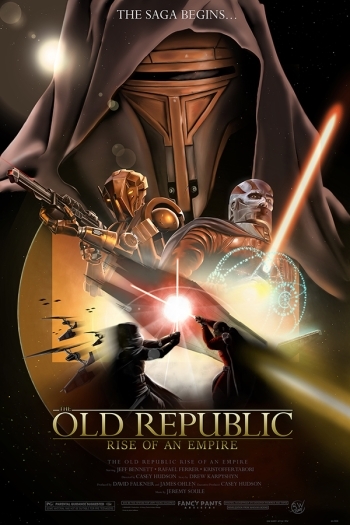 SWTOR forum user Aedict has posted in the Community thread his version of a poster for a Knights of the Old Republic movie. The detail and quality of the poster art is incredible. It really does look like something that could be used for the first movie in a trilogy, as the user’s forum post states. Would you like to see the Old Republic timeline in a movie setting? Open World PVP on Tatooine captured and posted by YouTube user Axurion Exeiro. I came across this video while catching up on posts on Google+. Thanks to Val Draakenfor sharing this video. The video does a great job of capturing some great Open World PVP on the Progenitor server. Whenever I see big battles like this it takes me back to the epic battles found in the movies. After all it is Star “Wars” and the conflict between good and evil. Be sure to watch the brief after the battle clip. Remember to let us know what you think of the video in the comment section below.